Really enjoyed our stay here. We had the double room ensuite, the bed was huge and very comfortable, and the hostel was very quiet so we were well rested. The staff is very friendly, especially Leidy, that prepared us vegan arepas and even gave me an arepa-cooking-class in the comunal kitchen. Would definitely stay here again! Oh also, great location. We really liked this cozy hostel! It's a good place to meet people and we loved the staff! Thanks for making our stay so pleasant! It's a very nice place to stay. Friendly hosts and friendly guests. My room was very new and I even got a private shower and toilet! Heel relaxed rustig hostel, dicht in het centrum. Very nice, quiet and clean hostel to stay. Perfect to meet other travellers. Breakfasts was ok, quite frugal. Would come back! Basic and clean rooms that are good value for money. 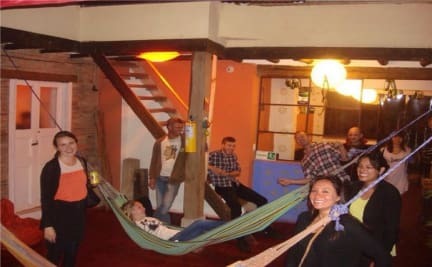 Not really a party hostel, that attracts an interesting mix of Colombians and Europeans. Also if you speak only a little bit of Spanish the owners are very patient in giving you good advice about bogota and Colombia. All in all I would recommend this hostel.